It is not easy to find a provisional patent examples because they are not published or easily searchable online like regular utility non-provisional patents. A full non-provisional patent application will get published about 18 months after you file it. A provisional patent application will remain secret unpublished (i.e. you cannot find it through Google). This is either an advantage or a disadvantage of a provisional patent application depending on your goals. If you want to learn more about a provisional vs. a non-provisional please read this post. Download Provisional Patent Application Example 1 -Here is the application that was filed. Download Issued Patent - This link is for the issued patent (note we are the ones who argued with the patent office to get this patent allowed for the inventor). Download Provisional Patent Example-2 - Here is the application that was filed. 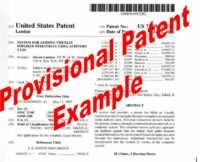 Download Provisional Patent Example 4 - Here is a MS Word version of an application which started off as a provisional patent application and was converted to a non-provisional (note: this is not the best way to do this). If you look at the examples above, a provisional patent application should look exactly like a regular non-provisional application so its a lot easier to search for those and use those as your template or guide. If you want to learn how to search patents, I wrote an short guide here: How to Search Provisional Patents. A provisional patent application does not need claims or formal drawings. This is one reason why it's a lot cheaper to file a provisional patent application because you can save on the costs of having fancy drawings made. There is some debate amount patent experts on the need to include claims with a provisional patent application. Although they are not technically required, there are some reasons why it would be beneficial to have at least one claim. In my video guide that I provide to my clients I share with them the reasons why I think writing one good claim is very important.